Chance and I have been out to check on the dead deer in the field many times. It was fairly simple to do once it snowed..there was no eagle activity. We would drive by slowly..the deer was just a snow covered bump in the field. Sunday it was really warm, it was about 45 degrees..the snow began to melt and late in the afternoon the eagles returned. The aroma must have been too much for them to resist..either that or the lake is frozen over in their favorite fishing spots. They seemed content to pose for some photos. They hopped around a little but didn’t fly away. There was a plane buzzing around. See that speck in the sky? That is Reino flying around, his wife is part of our carving group. I asked her if her hubby was out flying around on Sunday afternoon..she said “Oh yes.” So I will print her a photo..it isn’t often that you get a picture of your husband soaring above some eagles. Far Side wanted to show you a photo of some idiots. They are North Dakota idiots ( their vehicle had North Dakota License Plates), I ran down the hill and barked at them. I ran out on the lake just a little..when Far Side shrieked for me to come back..I did. Far Side wondered if they had spikes in their shirt pockets, just in case they fell through the ice. Her Uncle Andrew always carried them in his shirt pocket all winter..especially to the fish house. She would tell him to be careful on the ice..he would pat his pocket and say “I’ve got my spikes.” If you fall through the ice into the water, you can use the spikes to claw at the surface of the ice until you get a good enough grip on the ice to pull yourself out. I sat and watched the fisherman while Far Side took this photo just before sunset. Nothing exciting happened..they didn’t fall in the lake..but I wasn’t allowed out on the ice to see how thick it was either. That snow that we got the other day is still here. It was not a bad dream or a figment of my imagination. And guess what..it was so fluffy and light that it settled. It even snowed a little more..perhaps that was the culprit..it was a heavy snow. This snow on top of the very thin ice that was on the lakes makes a nearby lake look safe..when it is not. The thin ice is just disguised by the snow. We have not had enough below zero ice making weather to make the ice strong enough for people or vehicles yet. Shell Lake yesterday, November 27, 2010. I like this lake the best in the spring..Shell Lake in May 2010. Savannah our eldest granddaughter is very talented, she can draw just about anything. In 2006..oh gosh that was four years ago already..
She was awfully cute..pink earrings and all. She drew a picture using chalks in her art class. Her teacher was so impressed he entered her piece of art in a contest. She won!! Her art work was made into a poster. I did take a photo of it a long time ago. It is still rolled up and in a tube..but it is now signed by the artist. We need to get it matted and framed and displayed. She is now a Freshman and she is finally getting to take an art class in High School. Some of her art ends up on pieces of clothing..T-shirts and old jeans have been remade into walking pieces of art..nothing that I would wear..but she has fun creating and designing. I love the long days of summer, the evening light is perfect for some great photography. The perfect Pee Gee Hydrangea blooms that I have waited all summer for are at their best in August. I can stay out till at least 9PM and still have good light for photographs. Fall enters and the cooler temperatures change everything. My Hydrangea is still beautiful, I appreciate the different hue it takes on in its Fall dress. I can still take photos in the evening..but I am back home by 8PM. Then it gets colder and darker. We get some frost..I can still see some beauty in the Hydrangea blooms..a frosty beauty. Staying out till 7PM is still possible if the sun is shining. Then it happens Daylight Saving Time drops us into the dark depths of winter..now I must go out in the afternoon to photograph anything..and if it is cloudy by 4PM I am done. It snows and covers up my blooms. Soon the snow will accumulate and cover the entire plant..it will be just a few twigs sticking in the air. It will be entrapped in the deep freeze for months. As the Hydrangea progresses so does my overall mood. I get a tad crankier. My good moods are few and far between. I think they are stuck in the snow bank just like the Hydrangea. We are spending a quiet day at home, cooking a turkey and thinking about how we can use all the leftovers..Turkey Hotdish, Turkey and Biscuits and Gravy and Turkey Salad Sandwiches are some of our favorites. We will make two different kinds of stuffing/dressing..one with sautéed giblets for Far Guy and one with apples and raisins for me. I like the dark meat, Far Guy likes the white meat. How many of you remember this Thanksgiving song by Lydia Marie Child? Far Guy and I tried to sing it the other day, neither of us could remember all the words. We both learned it in grade school. I wonder if the music teachers use this song anymore? It was written in 1844 as a poem. When I write Wistful Wednesdays I look back through my many files of old photos until a photo strikes my fancy. A photo that begs to be written about. To the best of my Aunt Anna’s recollection these are people from Finland. It seems my Grandmother sent a box of clothing to Finland after their wars..because the Finnish people had nothing. The Finns being in such close proximity to the Soviet Union fought them during the Winter War and the Continuation War, they also fought Germany during the Lapland War. The Finns survived, but their economy was a mess…some of the Finns lost all of their possessions from being burned out during the wars. This is a photo that these Finnish people sent back to my Grandparents to thank them for the clothing. This photo was probably taken in the late 1940’s. So on this eve of Thanksgiving..if you have clothing be thankful. It had to happen, sooner or later we had to get the third snow. This is the one that usually stays for the winter. No happy dances were performed during this event. Yesterday was miserable, the roads were icy and snow covered. Far Guy made me a snow stick. You might see more of this stick over the winter. We put it out in an area that were we don’t remove snow, we will have to see how it works out. Chance catching a few flakes. He likes the snow, it makes him energetic. We had to go out and play ball again in the dark..in the snow..he is becoming more obnoxious about playing ball in the house with the cold weather. You have to watch where you walk as you could step on a ball. I will be fine as long as I don’t step on two at one time. Yup, just about five inches of beautiful sparkling snowflakes have piled up in the last 24 hours. Today the sun is shining. You can see my path over to the snow stick. I am not quite ready for winter to stay…after all it is a whole month yet until the first official day of winter. I have lived up here in the Northland all my life, except for a few glorious winters that were spent in Colorado and Florida. In Colorado it snows one day and melts the next and it hardly ever got forty below zero, and well Florida speaks for itself..sunshine and rainbows all year round. Sometimes Far Side scares me, not on purpose..well maybe. Like over at Cedar Lake which is in the Two Inlets State Forest. There was a dock pulled out of the water at the Public Access. In Minnesota most people pull out the their docks because in the spring when the ice goes out the force of the ice moving around in the wind and coming ashore can take out your entire dock..so it is one of those rites of spring..the “putting in” event in the spring and the “taking out event” in the fall. Then Far Guy being my brave leader and hero got up there..how did he do that? I wanna go too..If he did it I can do it too. Sometimes you just need a friend to show you the way. One that encourages you along the way. One that greets you after what seems like a really long scary journey. Imagine Chances reaction to the ice that covered the local “Mill Pond” yesterday. This is Straight Lake at the Mill Pond..I am not sure if the big lake is frozen yet..probably not. I had thrown that stick out on the ice for Chance…he is no dummy and would not go after the stick. Far Guy had to try out the ice..I was certain he was going to get wet feet..but he only succeeded in making a big crack in the ice. Winter has arrived, there has been just a little snow overnight..the ground is not quite white. It looks like our “third snow” is the one that will stay till May. Oh well that is only six months away. Six months of cold, six months of snow, six months of dreary days that is how we “do” winter here in Minnesota. I have to remind myself it is a privilege that not everyone has, I am lucky, very very lucky. It has been so dreary that we finally moved our woodcarving into the house..it makes a bit of a mess..but it will keep Far Guy sane. I have half a million projects to do and could keep busy for years, but I will carve too, at least until the Christmas tree takes up the carving spot. 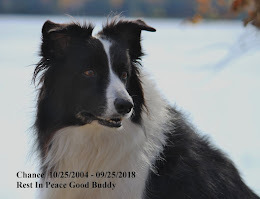 It is I, Chance the most handsome blogging Border Collie in Minnesota. We didn’t see any more eagles in the field. Far Side was in a real funk..so after errands in town Far Guy drove her out to the point. The point used to be kinda a teenage place to do a little necking or if you are older and have a camera it is a good place to take some photographs. It was cold, there were white caps on the lake. The wind was blowing the water up on the foliage on the bank by the boat channel. Yes, that white stuff is ice. I had to smell around this tree a really long time. Far Side had to go back to the car to warm up several times..the wind chill was way below zero. Finally she just gave up and told Far Guy where to go..that is drive..so that she could take a few more photos out the window so she wouldn’t turn into a human popsicle and freeze to death. She turned the heat on full blast but then rolled down her window. Silly girl! She would have got better photographs of the Canadian Honkers but I growled at them. One of them was standing on the hard water..as in FROZEN..on one leg. She missed that shot. She pretty much missed this one too..someone rolled down the window for me while Far Side was ducking behind the trees trying to be sneaking..apparently geese can smell a dog from a mile away. There is a new road kill or a not quite shot deer in the field across from our driveway. Oh, who knows perhaps it just died of old age right there in the field after it escaped the big hunt last week. The fresh meat attracts the Eagles, even in the cold weather the smell of death must attract them. I took this photo on Wednesday. Eagle lunch time. There were three of them vying for a spot at the venison buffet. Chance and I went out and waited in the right of way for a long time yesterday, hoping to see some Eagle action..we saw a couple of crows..that was it. This is where we waited, why is it that the one day that I could not stick around they were there and the next day when I have the whole afternoon to watch them..the Eagles are nowhere to be seen? I enjoyed the sunshine but not the wind that howled across the fields. There was a fair amount of traffic. Some people wave because they know it is just me, some people just stare because they are wondering what in the world I am doing ..thank goodness no one stopped to check on me. I wanted to walk into the field..but that would have been trespassing. The frozen field is probably rougher than a cob to walk on anyway. Food for the eagles and the coyotes..and maybe even the turkey vultures if they haven’t gone south or a wolf passing through. Nature is sometimes harsh like the November winds that blow across the prairie. In a day or two only the hide and a pile of bones will be left..the legs will end up over in our woods and the coyotes and Chance will play “Whose got the deer leg today.” Chance tries to bury them in the snow banks, once it snows. One winter Far Guy got one of the deer legs caught in his snow blower. He found Chances stash…clunk..clunk..and the leg went flying in the air in two parts instead of one. Chance was more than happy to find two different snow banks to bury them in. Do you get tired of Doctors Offices and waiting. I know I do. I had a little problem the other day and made a same day appointment and left Far Guy and Chance in the dust. No sense having them wait, when I am perfectly capable of waiting by myself. I had to register first and practically tell them when the last time I went to the bathroom was..in my case I felt like I had to go all the time. Then I had to answer the same questions..no I have not moved, no my phone number has not changed..yada yada yada. I needed a lab done before my appointment. They handed me a yellow sheet of paper and said “Here, these are the medicines you take, make changes if there are any.” Then I have to tell everyone what my name is and when I was born. Like someone is going to impersonate me. I was curious about the yellow page of paper..yup everything was correct..an aspirin, a multi vitamin , my blood pressure pill and a potassium pill because I cannot eat enough bananas to keep me alive. After my test I sat and waited and waited. I started to notice that other people had these large yellow pages also, it was like a big ticket. Welcome to the world of Pharmaceuticals…a pill for everything…and sometimes pills because you take pills. The handsome guy sitting two chairs down from me laid his on the end table, he was young maybe 25, his yellow page was almost empty. The elderly gentleman scooting around in one of those fancy red metallic flake scooters with the bag on the back that said “West Palm” who also had an accident on his grey pants ( reminder to self..carry a lap robe with you if you have room on the fancy scooter) was a two pager..two full yellow pages. Then he began to cough..poor guy..I imagined the wet spot on his pants growing larger as he nearly coughed his guts out and his silver haired tiny little wife searched her pockets for a Kleenex. Then he began to search his own pockets for Kleenexes..I bet if he found any they would have been soggy anyway. I reached over and grabbed a box of Kleenex and took it over to the poor guy. Two pages..I wonder what the maximum amount of pages is..Three..Four..I wonder when you are near death perhaps your number isn’t really up..but perhaps your pages are all full. I waited what seemed like forever, but since I don’t wear a watch and the Clinic has no clocks around, I have no idea if the twenty minutes that I am supposed to wait patiently before complaining has passed or not. Far Guy doesn’t like me to complain, but he is at home..so he will never know. I wait patiently, I can show restraint sometimes. I have not touched anything other than that Kleenex box..I feel the germs swirling around me. Finally the PA pokes his head around the corner and smiles and points at me..he doesn’t have a nurse..but he knows me ( he did not ask me to spell my name or for my birthdate)..and he is retiring next month..rats. We had a great visit..I have five days of meds for my bladder “irritation” and have a recheck next week..at which time I bet one more med is added to my yellow page. Recently I went through some of the old photos that belonged to my Grandfather and Grandmother Y. Amongst the photos were some interesting Real Photo Postcards. Real Photo Postcards were all the rage in the early 1900’s. You could have your picture taken and have it made into a Postcard, and then send it to your friends. The cost for the postcards was usually about a penny and then it cost you a penny to mail. So for two cents you could impress your friends. You could also keep them. This one is from 1910. An early hunting camp in Minnesota. None of these people look like my Grandpa..and nothing is written on the back of the postcard. Nine men and fifteen deer, it must have been a good hunt. They have a fire going and someone has slept in a Tepee. A. A. Richardson had a Photo Illustrating Company in Bemidji, Minnesota in 1910. ( His business only survived a year.) He notes on the postcard: This card is a genuine original photograph. This postcard also from 1910 is what I call “No compromise” or “We are stuck together..forever.” There was no Photoshop back then..this is obviously an original genuine photograph! Who knows if these two bucks were entangled to their death or placed that way by a taxidermist. Yesterday something spectacular happened to me. I got an atta girl..from my peers..some very special peers. The Blogger folks selected my Forgotten Old Photos blog as the Blog of Note for November 15, 2010. I was/am stoked..and still grinning from ear to ear! They have thousands maybe millions of blogs to choose from and only choose about 260 blogs a year..and mine was one!!! I am not sure if ya’ll know this. My regular blog Far Side of Fifty also appears locally in a Word Press foremat and can be picked up by many of the small papers in North Dakota and Minnesota that are part of the Forum Communications Network. Area Voices is where I began blogging almost three years ago. Far Side of Fifty is featured in many local newspapers online as an Area Voice. EXCEPT..the local paper in the town 14 miles from where I live. Even though I have contacted them several times..and once I even answered a plea by them for local blogs and bloggers. Perhaps I am too controversial for them…perhaps since I write the truth from my point of view, I make them too nervous or uncomfortable. Who knows perhaps I embarrass them..maybe I am too back woodsy or too cranky. Jo brought me over a gift, she was thrift store shopping and thought of me. A few more Shiny Brites to add to my collection..I did not have any of this design in gold so they are just perfect! Thanks Jo! I found a Lassie book..
or two at a garage sale last summer. They were a dollar each..and I couldn’t pass them up. I am not sure what I will do with them..right now I just stuck them in a basket above the television. Sometimes things are just fun to look at. I really should stick with collecting marbles and dice, they are small and take up practically no space at all but they are hard to find. At the Val Chatel sale if I had been one minute faster I would have had a jar full of dice and one of those big beautiful red ruby dice…but alas I stopped to look at the hundreds of rocks outside. The stupid rocks anyway. Far Guy saw the dice in their box. He whispered to me “Did you see that die?” YES..and he could see the look in my eye and it was not the look a nice old lady should have, I followed that couple around hoping that they would decide against buying the dice..they were really old perhaps one of them would stumble and the box would fly out of their hands. Would I have grabbed that dice while it was flying in the air..yes..the question is would I have returned it to them or ran to the checkout? I practically had to slap myself.. Far Guy finally offered the guy double what the die was marked..no sale. So perhaps I should just keep my goals in sight with my collecting and stop getting side tracked by cute little books that don’t take up much space and all the rest of those things that I just cannot pass up. Do you suppose shopping for Antiques is an addiction?